Are you looking for something to do with your family? According to Budget Travel, St Augustine has one of the 16 best Summer Attractions for Families. Swashbucklers, hoist your sails and head for the artifact-packed St. Augustine Pirate & Treasure Museum (12 S. Castillo Dr.). This is the only place in the world to display an authentic pirate’s treasure chest (property of Captain Thomas Tew roughly 400 years ago), plus a 19th-century Jolly Roger flag and an original “Wanted” poster with a 500-pound sterling reward for the capture of pirate Henry Every, dated 1696. Across the street, cannon-firing demonstrations take place Fridays, Saturdays, and Sundays at the Castillo de San Marcos fort. 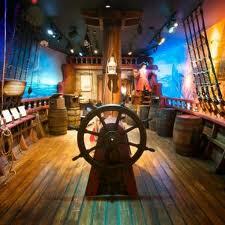 Visit St Augustine Pirate & Treasure Museum for more information.